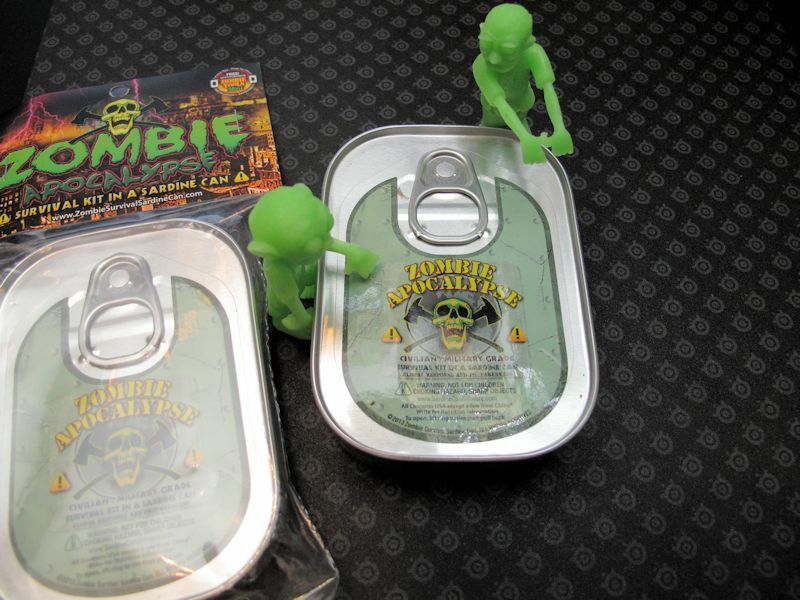 Zombie Apocalypse Survival Kit in a Sardine Can. I bought two of these kits online, one to dissect, the other to keep pristine. 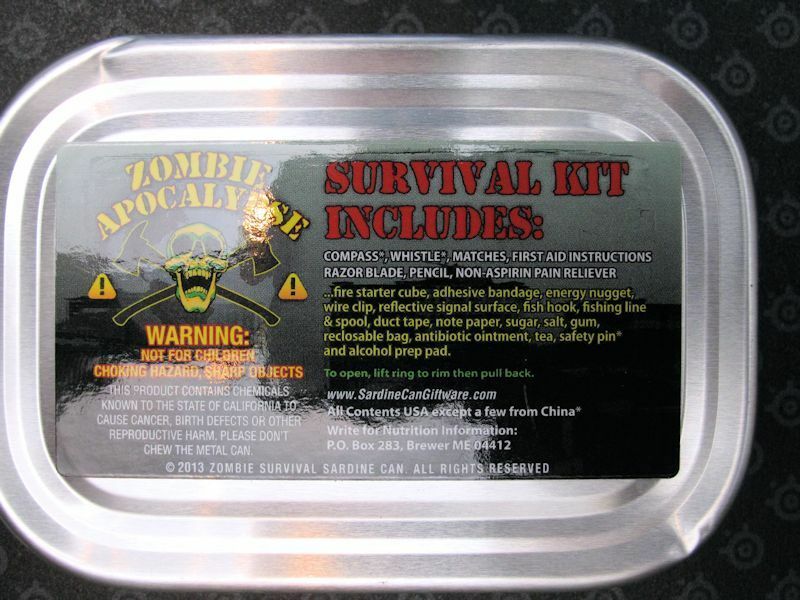 Asides from the interesting tie in with Zombies, I decided to get these as a representative of this type of survival kit. To be honest, I wasn't sure what to expect when I opened it. I did get a good laugh once I saw the whistle however. More on that later. My 2 Zombie friends were excited to see a kit designed to survive against them. They wanted me to open one up right quick. I somehow believe they think there are brains in there. I had to shoo them away as they were starting to drool on everything. Here is a closeup of the Sardine Can back label. Now this is a bit odd. Inside, once I got past the mini zip-lock bag, I spied the whistle. Now come on...seriously? This thing looks like it should belong in a carnival dime shop. I was puzzled at the stick on the back end...but quickly found out it is one of those whistles that you can change pitch. What the Hey! This is not something I would stake my life on at first glance. I tried it and failed miserably until I pushed that rod all the way in at which point the whistle was loud and clear, but for how long. This toy does not give one confidence that is for sure. Some food stuff in here as well. A stick of bubblegum, a little piece of a Tootsie Roll, a small package of sugar, salt, and one tea bag. How do I feel about this kit you may wonder? 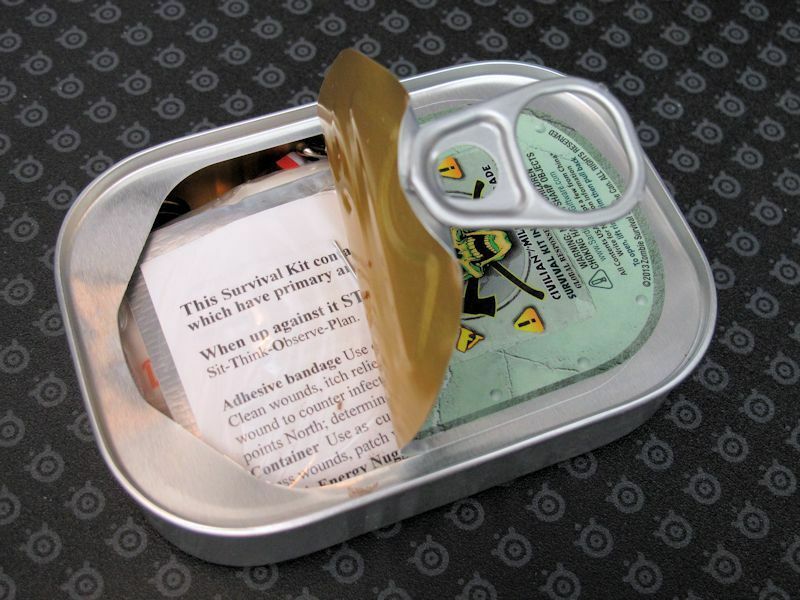 Well I wanted to try a sardine can type survival kit. The biggest con about this type of packaging, once it is open, you can't close it again. It is a one shot deal. On the plus side, the interior should be waterproof until you need this kit. With that said, I much prefer the Altoids type kits. 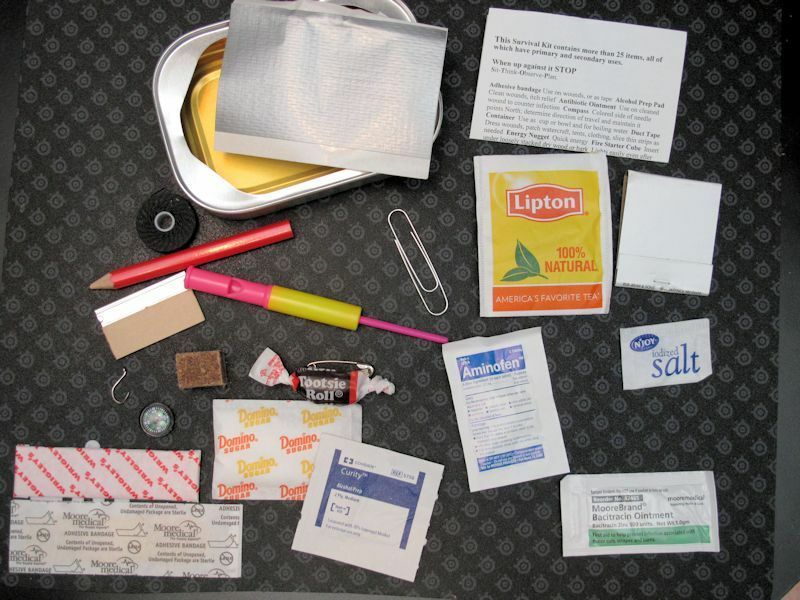 Not my ideal survival kit. There is a lot I would change and some things I would add...but that is a bit hard when the whole thing comes sealed. In my opinion, you are better off building your own kit rather than purchasing these. 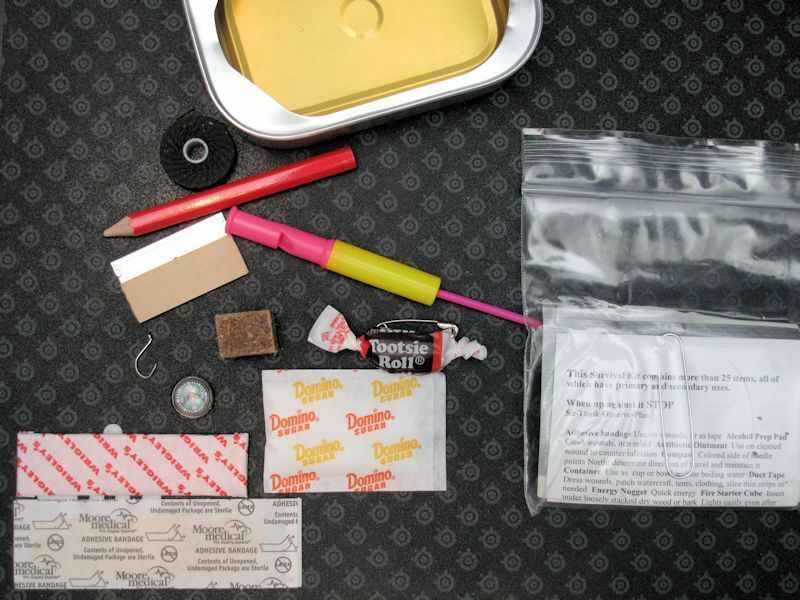 So there you have it, another Survival Kit mini review. 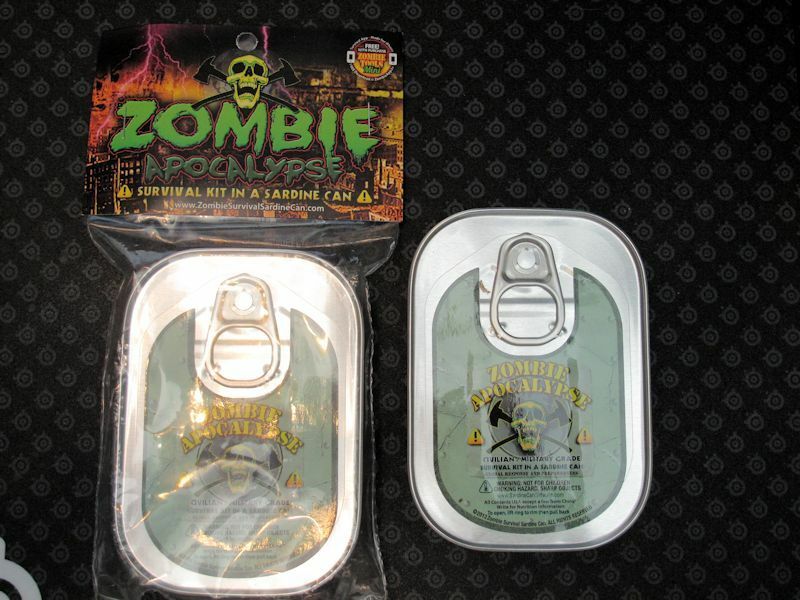 Re: Zombie Apocalypse Survival Kit in a Sardine Can. Wow. This looks like it is intended for the big Zombie Uprising of Halloween 2014! But then they put some medicine in there, so you can't give it to your kid for the Tree House Survival Cache™. Thank you for the review, Chako, but no, just no! What were they thinking? No clue. I do know that if I was to buy one pre-made, I would open one to see what is inside. In an emergency setting, that slide whistle would make me think...oh God, we are all dead! Not to mention the dangers inherent in sardine cans...sharp lacerating edges. Yes, that whistle made the whole survival kit worth it in my humble opinion. Yeah, you need a condom. You wouldn't want to have unprotected maritals with a zombie!